Where Can Murrow Take You? A degree from Murrow College ensures you possess the technical, analytical and critical thinking skills necessary to succeed in the highly competitive and dynamic field of professional communication. We offer majors and minors in three distinct academic fields of study in our undergraduate program: Communication & Society, Journalism & Media Production, and Strategic Communication. Create effective communication products (writing, visual, and speaking) to address communication objectives via multiple media platforms. Contact us to receive information about the programs that interest you at the WSU campus of your choice. The Communication and Society degree enhances your ability to manage innovation and change using modern technologies, tactics, and theories. You’ll learn to use mediated and non-mediated communication channels to purposefully transform your chosen industry – ultimately transforming yourself, your networks and your organization so it is fit to address pressing societal and political issues. This degree prepares you to build connectivity and enhance communication for in-demand jobs in medical and environmental communication, political and public policy, crisis management, non-profit organizations, and digital media promotion and strategy. You will become immersed in the journalism and multimedia production world through classroom and extracurricular opportunities. The JMP degree focuses on developing reporting, editing and producing skills across all media platforms. You’ll also gain proficiency in the use of professional digital editing technologies and professional-level radio and television studios. All majors acquire a thorough understanding of the legal requirements and ethical implications of journalism and media production. Graduates with this degree pursue careers in radio, television, newspapers, and multimedia news and media production in the Pacific Northwest and around the world. Students in the Broadcast News major learn to write, report, anchor, and produce newscasts and to shoot, edit, and produce news for radio, television, and online media. Students in the Media Production major develop the skills to produce, direct and operate complex video equipment for multi-camera sports, news, musical performances and other reality-based programs in the studio or on location. 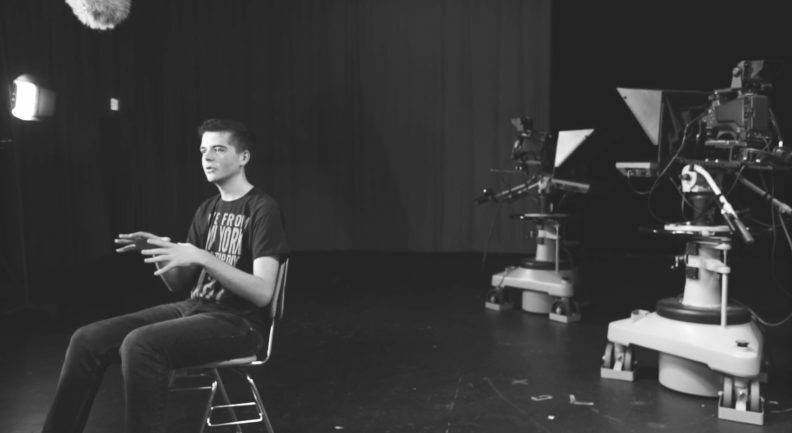 Students gain hands-on experience with digital media technologies, professional cameras, multi-tiered switchers, audio mixers and other studio equipment and learn to work on large- or small-scale scripted, reality, sports, game shows, e-sports, and other live or post-produced programs. Students in the Multimedia Journalism major gain knowledge about reporting and editing processes, as well as storytelling in online video, audio, and data-visualization mediums. The coursework expands skills in digital editing technologies designed to help students become storytellers through reporting and editing across all media platforms. Learn to communicate creatively and persuasively to build mutually beneficial, long-term relationships between organizations and their target populations. You can specialize in public relations or advertising and graduate with marketable job skills such as persuasive writing, survey research, digital media, and campaign management. Learn how to appeal to consumers effectively by designing and evaluating advertising initiatives using a variety of media platforms. Learn how to foster beneficial relationships with key stakeholders and build and maintain a positive public image for a company or person. The Minor in Communication requires a minimum of 18 hours, nine of which must be at the 300-400 level. Nine hours of upper-division work must be taken in residence at WSU or through WSU-approved education abroad or educational exchange course. Students may apply to certify in the minor after they have certified in a major outside the Murrow College of Communication, completed 60 credits, and have obtained a WSU GPA of 2.7 or better. The minor in Sports Communication requires a minimum of 18 hours. Four of the six courses required for the minor must be from the College of Communication. The minor in Communication and Culture requires a minimum of 18 credits. Students pursuing a degree in the Murrow College may apply only two courses from their major coursework to this minor. For all other areas of study, check with your primary advisor. Communication and Society students are not eligible for this minor. The minor in Environmental, Risk, and Science Communication requires a minimum of 18 credits. Students pursuing a degree in the Murrow College may only apply two courses from their major coursework to this minor. For all other areas of study, check with your primary advisor. The minor in Health Communication and Promotion requires a minimum of 18 credits. Students pursuing a degree in the Murrow College may only apply two courses from their major coursework to this minor. For all other areas of study, check with your primary advisor. This major is intended for Murrow students only (with the exception of Risk & Crisis students).